Research shows that an inspiring and informed teacher is the most important school-related factor influencing learner performance. Given the poor performance of South African schools in this area, it is critical that we pay close attention to how we train and support both new and experienced educators. Continuing Professional Teacher Development (CPTD) is an integral part of teacher education because only continued learning and training assures a high level of expertise and ensures teachers keep up-to-date with new research on how children learn, emerging technologies for the classroom and new curriculum resources. It was the crucial question of managing CPTD that formed the main theme of a recent Teachers Upfront seminar. One proposed solution was put forward by Charles Marriott, director at Deliver – a non-profit organisation that specialises in developing emotional intelligence and leadership skills in educators and students. Marriott profiled his organisation’s NALEDI programme – a face-to-face approach to CPTD which turns the focus on teacher development away from solely cognitive training towards emotional and relational practice. The programme centres on dialogue circles – a safe, supportive space wherein members can talk about sensitive topics, share working practice, work through differences, and build consensus. Marriott’s initiative was followed by a presentation by Dr. Richard Kieck, the Operational Head of the Curro Group, who discussed a more embedded approach to training. This approach looks at the question of professional development within the organisation – a long-term view for developing leadership skills, progression and growing capacity from within the school. Kieck looked specifically at providing quality middle management in schools and explored the issues around appointing and developing staff. To this end, Kieck cited a leadership study by Jack Zenger and Joseph Folkman (2014) in the Harvard Business Review which identified a focus on results, inspirational problem-solving and analytical thinking, and high levels of integrity as the most highly-sought traits of innovative and effective managers. 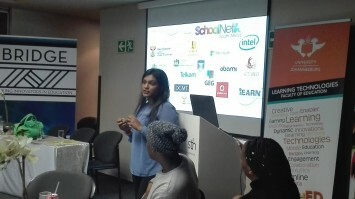 Following on from Kieck, Omashani Naidoo of SchoolNet SA shared the work of her organisation in the area of professional teacher development. SchoolNet SA has a variety of training programmes fit for various purposes. Some programmes are face-to-face, others use web resources and social networks, and others still are a blended model of all of the above and used to accommodate the different skills levels within a school. Naidoo made special mention of SchoolNet SA’s train-the-trainer model – a distributive process which fosters collaboration among educators through peer teaching strategies. Mr. Xolisa Luthi, the Gauteng Department of Education (GDE) Deputy Chief Education Specialist in Teacher Development, presented the seminar’s final CPTD model. Luthi discussed the GDE’s long-term view to develop teachers in the use of ICTs. The online-focused initiative forms part of the department’s larger mission for education in Gauteng: a commitment to providing functional and modern schools that enable quality teaching and learning. The GDE’s efforts are manifold and include the incentivisation of well-performing schools through the provision of ICT resources and training programmes in Microsoft through the Sci-Bono Discovery Centre and the Matthew Goniwe School of Leadership and Governance. Additionally, the department is partnering with Vodacom in establishing digital classrooms as well as with Pearson to provide online diagnostic assessments for maths and English language teachers. The seminar came to a close with a round of questions and comments from the audience. One particularly important contention raised was the issue of terminology and whether the term ‘training’ implies that teachers are inherently deficient. While we cannot overstate the importance of CPTD in South Africa, we may need to consider if terms such as ‘upskilling’ and ‘capacitation’ would better motivate educators to actively pursue their continued development for the ultimate benefit of learners.